In this book, a distinguished group of clinicians provide straightforward, focused answers to the questions most commonly confronted by a multidisciplinary team when caring for patients with rectal cancer. The format of the book is designed to aid optimal decision making in a multidisciplinary setting with respect to key issues in imaging, radiotherapy, chemotherapy, and surgery, all of which are considered in detail. Helpful guidance is also offered on risk factor identification, pathology procedures and their prognostic value, and multidisciplinary team management. The authors have been carefully selected for their expertise, and most have been involved in the management of the more significant trials published in Europe during the past decade. In an era in which all patients are entitled to access healthcare systems that deliver the highest quality of treatment within a safe environment, together with appropriate advice, support, and long-term follow-up, the multidisciplinary team is of central importance. 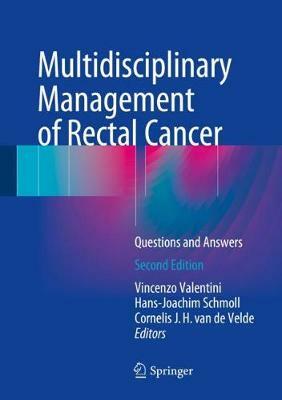 This successful book, in its revised and updated second edition, is designed to provide all the guidance likely to be required by members of the multidisciplinary team at various stages of the pathway of care for patients with rectal cancer.